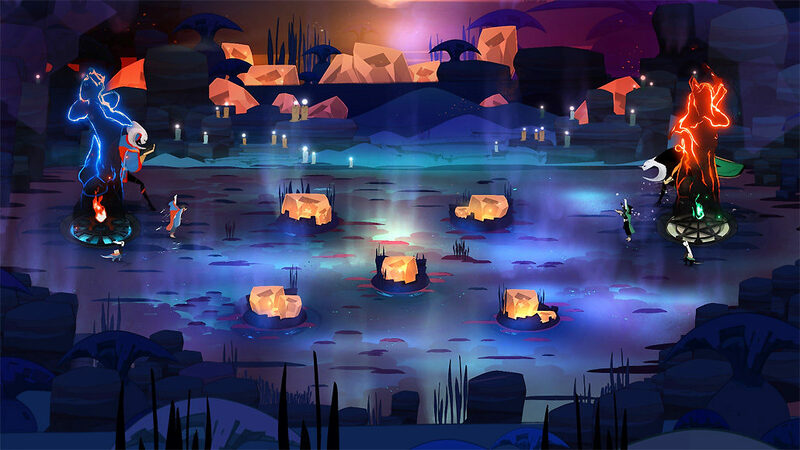 Pyre is a bit of a departure for developer Supergiant Games. The small 12-man studio was quick to establish a brand with their first two titles, Bastion and Transistor, which were both isometric RPGs with a focus on action, innovative mechanics, and gorgeous art. Supergiant’s third game builds on those acclaimed titles in some key ways, but also veers off into new and uncharted territory. Make no mistake, Pyre has the look and sound of a Supergiant game, but its gameplay is a quirky mix of party-based RPG, sports game, and visual novel. That’s not an easy combo to pull off, so does Pyre further build upon Supergiant’s legacy, or burn it to the ground? Let’s find out! Pyre casts the player as a blank slate simply known as The Reader, who has been condemned to the Downside, the vast purgatory/prison the powerful Commonwealth sends its undesirables to. Reading is outlawed in the Commonwealth, so being literate makes you a valuable commodity, and you soon become the de facto leader of a ragtag band of exiles on an ambitious mission. See, it turns out sports are still a big thing in this fantasy version of hell. In fact, you can earn your way back to the Commonwealth by competing in and winning sacred Rites. There’s an entire league devoted to these Rites, with established franchises, arenas and everything, and by luck you’ve been recruited to the Nightwings, the Downside equivalent of the New York Yankees. Unfortunately, the Nightwings are in a rebuilding phase, so you have to travel Downside enlisting and training new members. Most of these characters defy the usual fantasy tropes – there’s no garden-variety elves, dwarves, or orcs in Pyre. Instead, you’ll team with misfits like the scruffy mongrel Rukey Greentail, the chivalrous one-eyed worm Sir Gilman, and the bog-dwelling sorceress Bertrude. Each of these characters has their own voice, backstory, and web of relationships, which are revealed over the course of the game. Pyre paints a richer picture than either Bastion or Transistor – in addition to the broad cast, Supergiant have created an impressively detailed history and mythology for their new world. Sometimes it feels like Pyre tries to stuff in too much story. 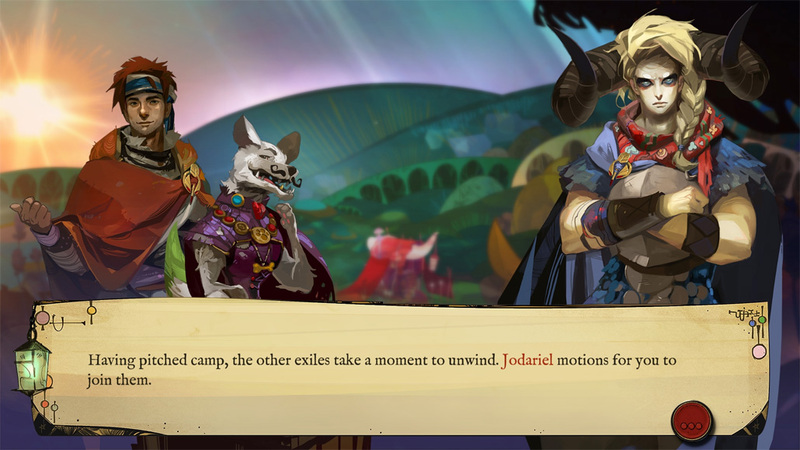 While earlier Supergiant games took a “less is more” approach to storytelling, Pyre loads on the dialogue boxes. Between the Rites, Pyre resembles a Japanese visual novel or old-school “Choose Your Own Adventure” book. You simply click on the map to proceed to your next destination, with interactivity limited to series of simple choices. Do you take the path on the left or the one on the right? Do you look for treasure or help train one of your party members? Your choices rarely change the story, but you will get various bonuses or penalties based on which paths you decide to take. I found the bits in between the Rites engaging enough, but those hoping for another full-on action-adventure in the style of Supergiant’s earlier games may be disappointed. At least Pyre provides plenty of visual and audio treats to distract players from all the text. The game’s various hand-drawn and painted worlds are trippy masterpieces torn from some lost issue of Heavy Metal magazine and character portraits, while not animated, are bursting with personality. Meanwhile, Bastion and Transistor composer Darren Korb cooks up another killer soundtrack, combining fantasy tropes with electronic beats and the occasional grungy guitar hook. If I’ve made Pyre sound a bit passive so far, don’t worry, the game also has its fair share of action. Pyre’s Rites are essentially a mashup of basketball and dodgeball, with a touch of magic mixed in. The goal is for your team of three to take control of the Celestial Orb that falls from the sky at the beginning of each match, then plunge it into your opponent’s pyre (a large column of mystical flame). Dunk on your enemies enough times and you’ll extinguish their flame and win the match. It’s a simple premise, but Supergiant complicates things in a variety of ways. All players are surrounded by a protective aura, which disappears once you take control of the Orb, leaving you vulnerable. Simply touching the Orb handler with your aura will banish them from the playing field for a few seconds, allowing you to take control. You can even cast your aura, firing deadly energy bolts across the playing field. Players also have their share of options while on offense. You can pass the orb between your teammates like a basketball, and all characters have a special move that allows them to run, jump, fly, or warp past the enemy front lines. These offensive moves consume your limited stamina, and most can be countered in some way. You’ll need to use them wisely. Pyre really does feel like a good arcade sports game. Movement is fluid and satisfying, enemy AI is sharp, and every character has their own unique feel. Often, you’ll simply rush out, grab the Orb and pop off a quick goal, but Pyre is at its best when you get a competitive back-and-forth going. You’ll be gripping your controller tight as you pull off multiple steals, last-second saves, and flashy moves. Pyre has some balance issues – characters who can move quickly or fly tend to be the best, and some teams are just naturally more challenging than others based on their lineup, but the game never becomes too frustrating. Pyre’s sports feel extends beyond the Rites themselves – being bested in a match doesn’t result in a game over, you simply chalk up a loss on your record and move on as a real sports team would. At a certain point, the game even introduces team leaderboards, which you can manipulate to your advantage. The ultimate goal of Pyre is to win Liberation Rites, special high-stakes matches that give you a chance to free one of your players. Frustratingly, these Liberation Rites only come up so often, and in between you’re forced to play through numerous increasingly-meaningless “regular season” Rites. Just like the season mode in your typical basketball or football game, playing the same teams in the same arenas repeatedly starts to become a grind. It also makes for a somewhat unsatisfying RPG journey – the game tosses out new worlds and characters at a rapid pace early on, but mostly rehashes content in its back half. Thankfully, Pyre doesn’t draw out its grindy bits too badly, as a single playthrough of the game will only take you 8 to 10 hours. That may sound brief, but it feels about right, and you can earn a variety of different endings depending on your choices and which characters you decide to liberate (you can’t save all of them), so replays are encouraged. Whether you’ll want to tackle another season is up to you. This review was based on a PC code of Pyre provided by publisher Supergiant Games. Pyre is an admirable attempt to create a new hybrid -- part sports, part RPG -- but only one of the game’s halves is a true success. Surprisingly, that’s the sports half. Pyre’s world is an enticing one, it just isn’t conveyed in the best way. 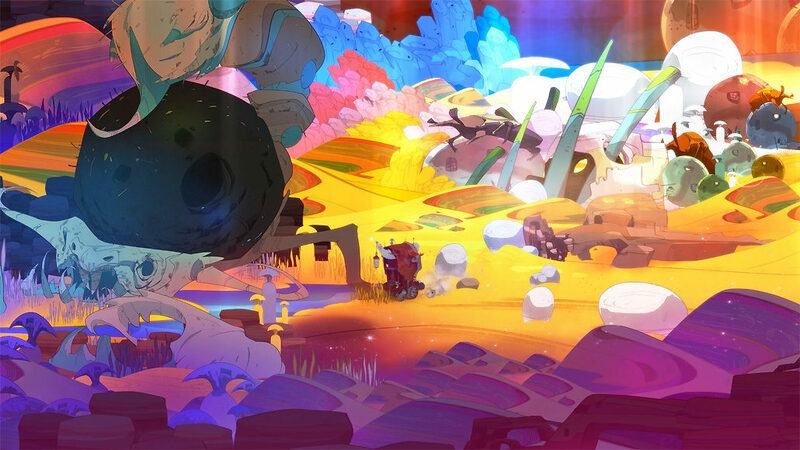 If you’re a sports game veteran willing to try something a bit different or somebody who mostly enjoyed past Supergiant games for their sumptuous audio and visuals, Pyre should light your fire. Unfortunately, those hoping for another full-bodied action-RPG experience similar to Bastion or Transistor may be left a bit cold.